Choosing the right changing bag can be a bit of a minefield. 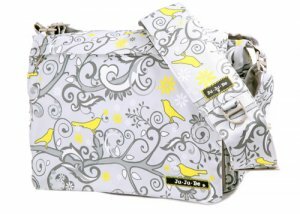 Mums want it all-a stylish bag that has enough compartments for bottle/nappies/changing mat/napy cream/nappy bags/soothers/change of mini clothes/wallet/keys while remaining compact not clunky! It needs to be waterproof and also spew/splatter proof while still presenting a sought after design. I heart this little beauty on sale at the moment from bumptobaby.ie.